It all started in the early twentieth century, when the Yacobian brothers, Giragos and Krikor, left Armenia to establish a better life in the land of opportunity and freedom, America. They first settled in Watertown, Massachusetts. following years, through the Roaring Twenties, their business prospered. Shortly after the onset of the Great Depression, Giragos acquired a large old and worn hooked rug that had been discarded. Giragos, with his extensive knowledge of antique hooked rugs and his keen eye for beauty recognized that he had a unique antique in his possession. After several years of research and 100’s of hours of meticulous repair, the rug was ready for sale. It was truly a magnificent rug, measuring a full 10 ft. sq. and had a majestic African lion as its focal point(lion rug pictured above). Unfortunately it was the Great Depression and rare antiques were not selling. 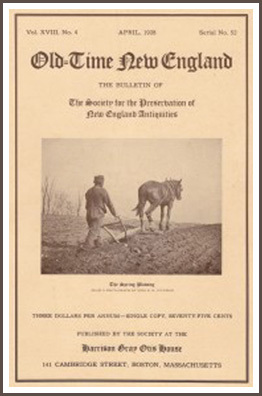 Giragos made several attempts to sell the rug, even taking out ad in the Boston globe as an open letter to Henry Ford, a known collector. The depression got deeper and the rug remained in the Yacobian family. At the onset of WW II the depression came to an end, but the 40’s also brought an end to the Yacobian Brothers, when Giragos died of a heart attack and the doors were closed. 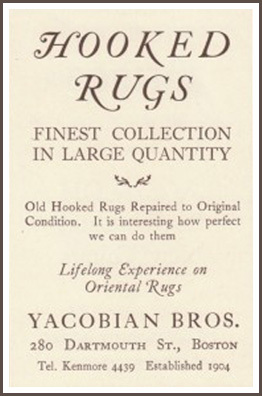 Yet, this was not an end of the Yacobian family and retail rug sales. 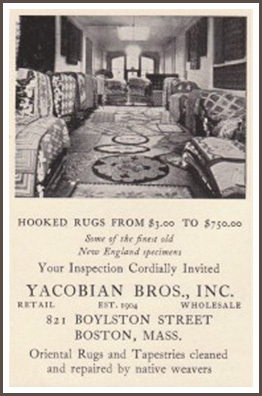 In 1950, Giragos’ youngest son, Gregory, after spending several years as a carpet installer in the rapidly expanding “wall to wall’ market, opened a small rug store in Wollaston Ma.,. Greg named his new store Colony Rug Company He was ambitious and hardworking and in a few years he moved his growing business to a larger and better located store in neighboring Quincy, on the busy Southern Artery. During the next 15 years Colony Rug continued to grow and develop a reputation for quality and integrity in the local communities. 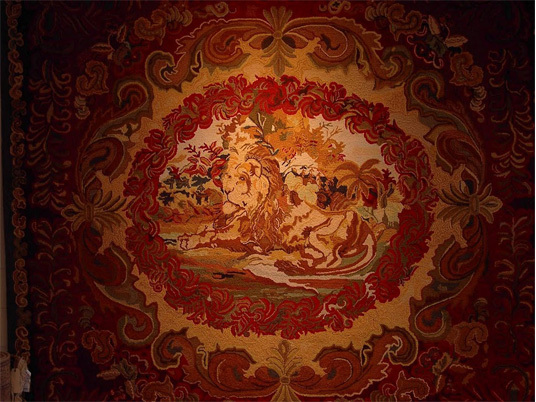 It was during the mid 50’s that Greg found a collector who purchased the Lion Rug and in turn he donated it to the Shelburne museum, in Shelburne Vt. This magnificent representation of early colonial craftsmanship can still be viewed hanging amidst many other beautiful works of colonial America.As the years progressed, Greg, ever with an eye for diversification, expanded his business into the rapidly growing braided rug market. Colony Rug specialty became custom hand and machine braided rugs, with many over the years being designed and shipped to various homes and businesses all over the U.S. Within just a few years Colony Rug employed over 12 women hand braiding rugs in their homes and three women working the machines to keep up with the growing demand. Adding to this demand for braids was the opening of Greg’s second store in rural Hanover, at the intersection of old Rte.3 and Rockland St. As the years progressed and demographics changed, Greg saw that Hanover and the surrounding communities would become the retail future for Colony Rug. So, in 1964, Greg purchased land on Rte. 53 and built Colony Rug. By the early 70’s the Hanover store had become the company’s headquarters. It was at this time that Greg Sr’s son, Greg Jr., came into the business. For the next 8 years he focused on expanding the wall to wall aspect of the business, as the popularity of braided rugs faded. Though that was successful, Greg had a desire to take the Company in a new direction. Leaving the commodity end of the market and moving in the direction of becoming an exclusive dealer of custom floor coverings and carpet. In 1984 Greg turned the business over to his sister and brother in law, John and Beverly Martini. 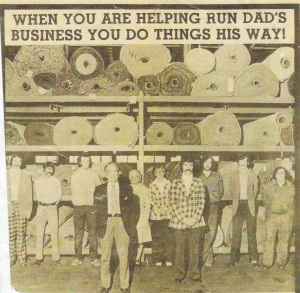 With their vision, drive and talent they turned Colony Rug into a purveyor of designer floor coverings. 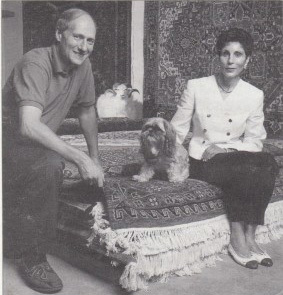 Today, 35 years later, their pursuit of quality and excellence has made Colony Rug into one of the most respected, specialty floor covering stores in the New England area; acknowledged by both designers and manufactures alike for their integrity, uncompromising quality and selection, professional service, and meticulous craftsmanship. Paige Pieroni joined Colony Rug Company in 1997 and currently serves as its President and fourth generation. 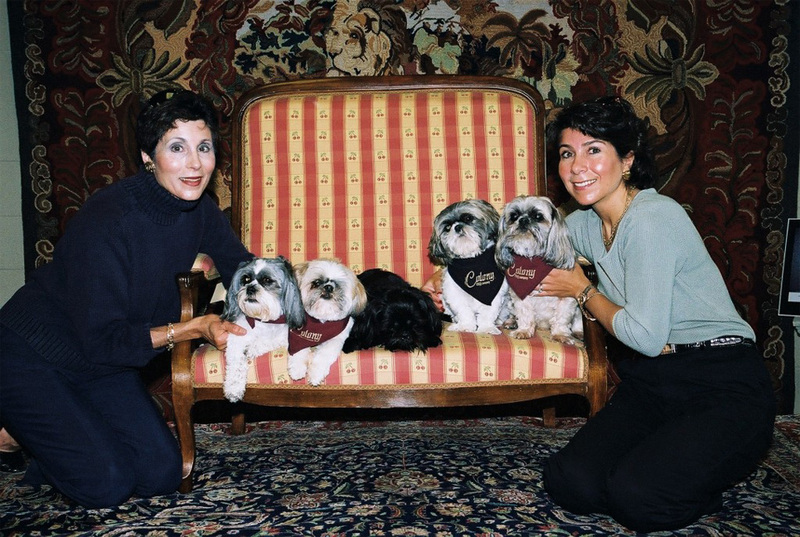 Her family has owned and operated Colony Rug Company since 1950, with Paige assuming ownership in 2011. From overseeing the day-to-day operations, to staying in tune with the ever-changing design trends, Paige has guided the company from a primarily local retail based storefront to one that has evolved into a designer destination showroom. While maintaining a strong client base in the Boston area, Paige and her team has led the company to expand into new markets throughout New England, the Islands & the entire East coast. In 2018 the company moved into it’s new home in Hingham, serving as the ideal showroom and workroom facility. This new venue will help continue the tradition of excellence Colony Rug richly deserves, but never takes for granted. Colony Rug and its strong designer affiliations continues to stay in tune with client needs, with top-rated workmanship and attention to every detail, Paige and her team are poised to lead Colony Rug into the future.